''I cannae believe it!'' as they say north of the border. 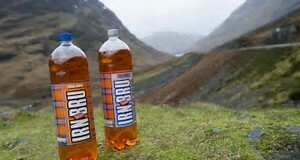 ''Irn-Bru isn't Scottish, it's American'' Surely not! The famous drink is as much Scottish as bagpipes, haggis and kilts. But no, it seems that the fizzy and vividly orange pop is not Caledonian after all. Researchers claim that its real roots lie in the USA and to make matters worse it is said that an English firm invented the iconic 'strong-man' image, a version of which features on the Irn-Bru label today. The history of the drink has been researched by David Leishman and he claims that its owners, Cumbernauld-based firm AG Barr, made the brew Scottish through branding and advertising and that it was not invented in Scotland. Mr Leishman, a Scot who teachers at Grenoble Alpes University in France, discovered that the fist Iron Brew drink was launched in 1889 and was sold as 'Ironbrew' by a New York based firm Maas & Walderstein. It was initially described as the 'ideal American drink'. It was sold in the UK by Stevenson & Howell in 1898, with the London-based firm registering the strongman trademark. However, when AG Barr began selling the drink they used their own 'secret recipe' - still a secret today. So maybe that secret makes it Scottish!